Professional self-inking rubber stamps are extremely reliable due to its robust metal framework yet light due to its outer plastic casing. The ergonomic design and handle ensure optimal comfort and professional self-inking rubber stamps are designed to minimise repetitive strain. To further extend the life of your stamp, order the suitable replacement ink pad 6/511/2 blue/red or single coloured pads 6/511 available in black, blue, green, red and violet. Produced climate-neutral with maximum possible use of recycled plastic and compensation of unavoidable CO2 footprint by investment in climate protection projects. 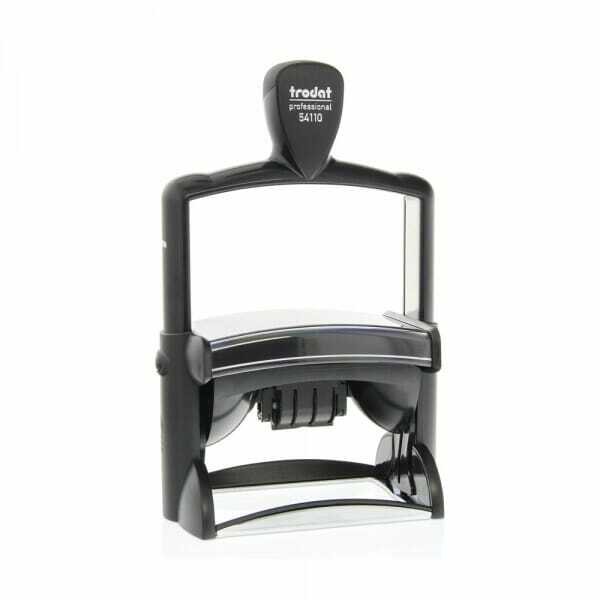 Customer evaluation for "Trodat Professional Dater 54110 2-5/32" x 3-5/16" - 5+5 lines"